"You monster! Return Tenchi to me!" 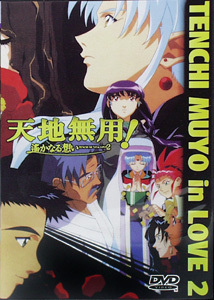 The lengthy saga of Tenchi Muyo (Useless Tenchi) comes to a conclusion after several series and three movies. Though labeled Tenchi Muyo in Love 2, this is actually the third movie in the series. Tenchi and the alien girls must battle the most insinuous villain of all: one who steals Tenchi's heart. While Ryoko (Ai Orikasa) and Ayeka (Yumi Takada) battle endlessly over the affections of Tenchi (Masami Kikuchi), he goes for a walk in the woods. When he sees a huge old tree, he walks right into it and vanishes, not to be seen again for six months. Having taken jobs as waitresses, Ryoko and Ayeka, with the aid of a Tenchi detector supplied by Washu (Yuko Kobayashi), try to find out what happened to him. When they spot him, he just as quickly vanishes, leading to a puzzle that seems insoluble. And who is this woman Haruna (Kikuko Inoue) that they keep seeing him with? And why can't he seem to hear or see them? The film spends no time whatsoever in any sort of recap, assuming that all viewers will be familiar with Tenchi and the clan of oddball women that surround him. Since it's the finale, it's hardly a good jumping-on place for the casual viewer. Fans will probably enjoy this entry in the long-running series, although elements of it are seemingly reminiscent of the first two films. The animation is back in the more familiar style that had been dropped in the second movie. The picture tends to have fairly languid pacing, without much in the way of action. Nor is there any character development, since they are already at the end of their arcs. The only point of novelty interest is the identity of Haruna. The solution of the problem seems inordinately drastic, but the soap opera aspects of the Tenchi story at least have a form of resolution in that he finally chooses one of the women who have been clamoring over him for so long. The disc, an import from Singapore, is region 0 and NTSC. It will thus be playable on ordinary DVD players in the US and Canada. It is not a bootleg, being licensed to Odex by Pioneer. However, since the Region 1 disc is just as inexpensive, this offering has less appeal than some Odex releases that are more pricey in their Region 1 counterparts. The Singapore import does, however, feature the full Japanese credits for those who insist on complete purity of their anime. Image Transfer Review: The nonanamorphic widescreen picture looks okay generally, although there are some segments with severe dot crawl along the animated lines. Otherwise, color is good and the lines are sharp and crisp. Blacks are solid and did not demonstrate notable artifacting. Audio Transfer Review: Only the original Japanese is presented in a 2.0 track that has mild surround effects. There is an effective rainstorm and in places a deep, thumping bass. It's a fairly subtle track and serves the more relaxed pacing of the film well. Extras Review: The only extras are promos for this DVD and for Strange Dawn, Boys Be..., Sol Bianca and Nanako (Operation 1). A mere 5 wholly inadequate chapters are provided for a 94 minute film. A variety of subtitles are included. Again, the Region 1 disc wins out with its mild extras. An entry pretty much only for devoted fans, with an iffy transfer and nothing to speak of for extras.